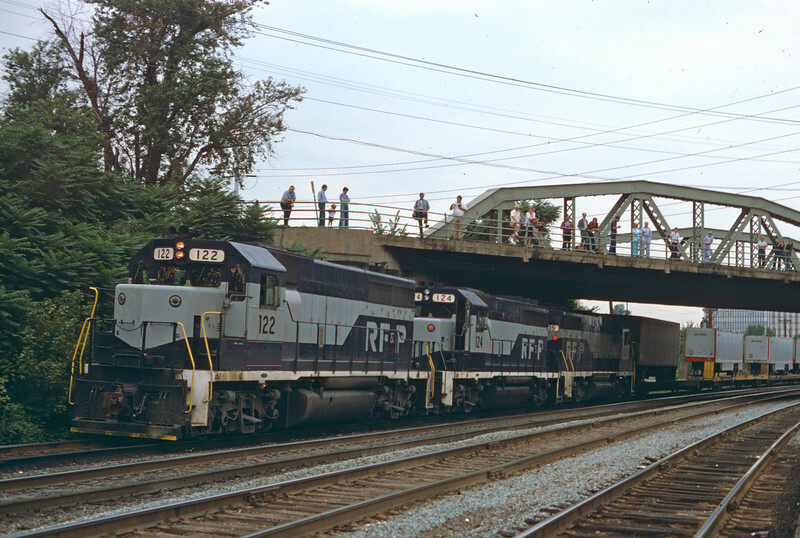 A trio of GP-40's are bringing a northbound high priority TOFC train into the Alexandria, VA station, just a few miles from the entrance to Potomac Yard and the hand-off to the Penn Central for the rest of the journey north up the corridor. The Richmond, Fredricksburg and Potomac (now part of CSX) was a small railroad with the important mission of linking Washington DC and the northeast with Richmond, VA and the southern seaboard. A few distinctive aspects seen in this shot include the absence of dynamic brakes on these diesels, a reflection of the flat-as-a-pancake topography of the RF&P, and the once ubiquitous drop-frame UPS trailers that were seen on every TOFC train across the nation. The many observers on the bridge are awaiting the imminent arrival of a Southern Steam Excursion.